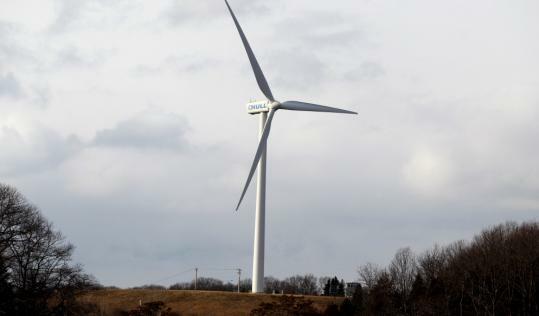 Wind turbine projects have faced harsh criticism in many places, but not so in Hull, which has been reaping the benefits of wind power for a long time. This seaside community is home to two modern wind turbines that generate electricity for the town, and has been hailed as a wind power success story. The very tip of the Hull peninsula is called Windmill Point — a name that dates back to the 1820s, when a windmill here was used to help make salt. In the production process, the windmill was used to pump seawater into vats where the salt could be harvested. In the 1980s the town installed a modern-day windmill on Windmill Point, next to Hull High School. From 1985 until 1996, this 40-kilowatt wind turbine helped reduce the school’s electricity bills by about $70,000. After the turbine was damaged in a windstorm in 1997, a group of residents and teachers rallied to replace it. The town’s electric utility agreed to own and maintain a new turbine. In 2001, the Hull Municipal Light Plant put the project out to bid, and ultimately settled on a model by Vestas Wind Systems, a company based in Denmark. Construction started that November and on Dec. 27 the new 660-kilowatt turbine — known as Hull Wind 1 — went online. Standing 164 feet tall with 75-foot-long blades, it was the first commercial-scale wind turbine of its kind to operate on the East Coast. During its first year of operation, it produced enough electricity to power 250 homes for the year. In May 2006, the town of Hull installed a second turbine — Hull Wind 2 — at the town landfill. This one was even more powerful, capable of producing 1.8 megawatts. The blades of both turbines continue to spin to this day, producing energy for the Hull Municipal Light Plant. Together, they generate enough electricity to meet more than 10 percent of the town’s electricity needs.